This modern Chevron Dragonfly Baby Shower was designed by Sarah De Jesus of Dreamers Joy Events & Design for her sister and brother-in-law who were expecting a baby girl. Sarah found that in some parts of the world, the dragonfly symbolizes change, self-realization, maturity, and a deeper understanding of life. 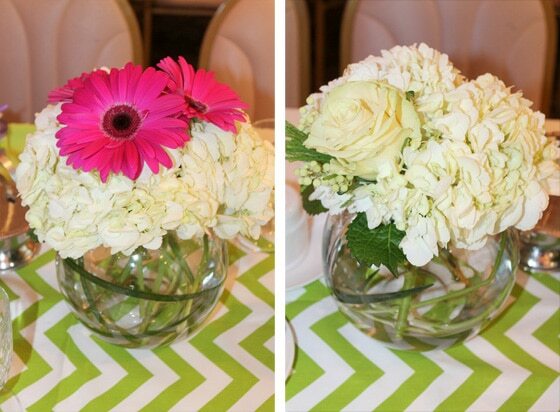 She also planned a gender reveal party for them which featured a green, white and tan color palette. She decided to stick with those colors and add purple to the shower to make it fun and girly. She also incorporated an ombre chevron pattern to give it that chic, modern vibe. 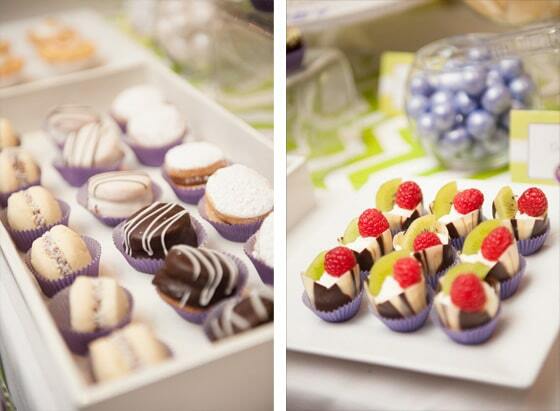 The dessert table was dressed in a white linen with a green chevron table runner. They served assorted candies including gumballs, Sixlets, chocolate covered pretzels, meringue, vanilla and chocolate cupcakes, brownies with cream, lemon meringue, raspberry and kiwi chocolate cups and sugar cookies. The cake took center stage! On the sides, Sarah used two wooden hand-painted shadow boxes which held the dragonfly inside, along with two tall white tulip arrangements with a purple gerber. 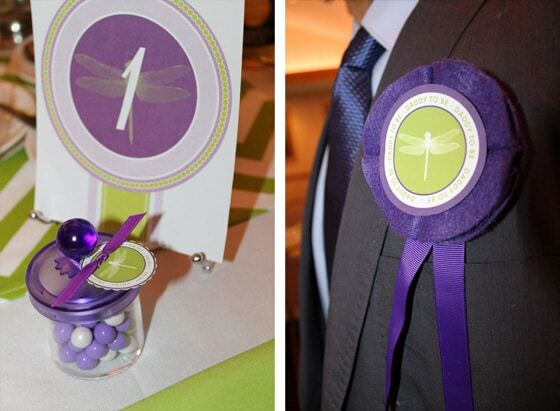 A cute small container and mini popcorn bags with cute dragonfly labels were given to the guests as favors. Sarah also made 3 fishbowl centerpieces for each table, which consisted of white hydrangeas, roses, purple gerbers and lily grass inside. Everything looked so lovely for the parents-to-be as they celebrated their soon-to-be bundle with family and friends. What’s your favorite detail in this Chevron Dragonfly Baby Shower? Let us know in the comments below! It was my pleasure. It was such a gorgeous theme and party! Do you have any idea where those little purple jars come from? I’m not sure but you can contact any of the vendors at the bottom of the feature.